A few weeks ago my husband and I had a quick getaway to New Orleans to catch Jazz Fest and enjoy a few days together celebrating our 13 year anniversary. We love New Orleans so much that we bought an income property there, which gives us a good excuse to visit often. Between the architecture, antiquing, food and music, there’s plenty to do there to fill my days. One of the things I love most about visiting New Orleans are the long walks since it’s such a walkable city. There’s so much to take in that I don’t even realize how far we’ve gone, especially since walking with a cocktail in hand is perfectly acceptable. 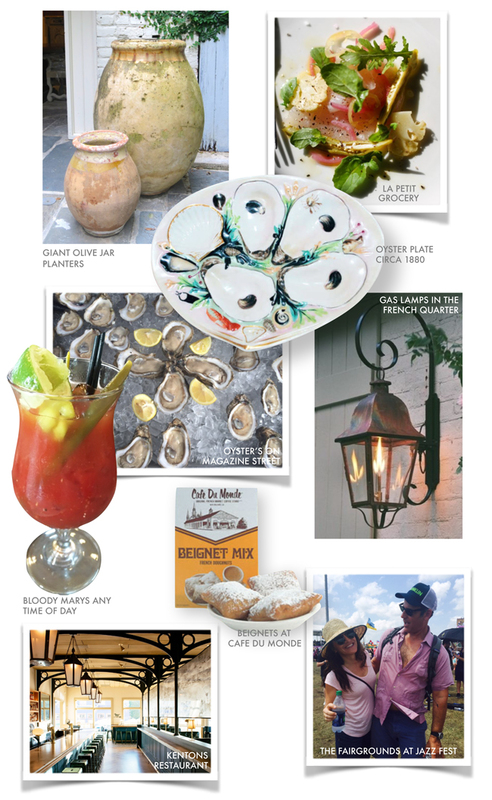 Next is lots of walking and shopping – stop at Antiques de Provence in the French Quarter for a great collection of mirrors, planters and furniture, Gorin Brothers for a hat, and Bevolo for beautiful gas lamps . Sterling Provisions in the Marigny has unique vintage furniture and Rebecca Rebouche is an interesting local artist.